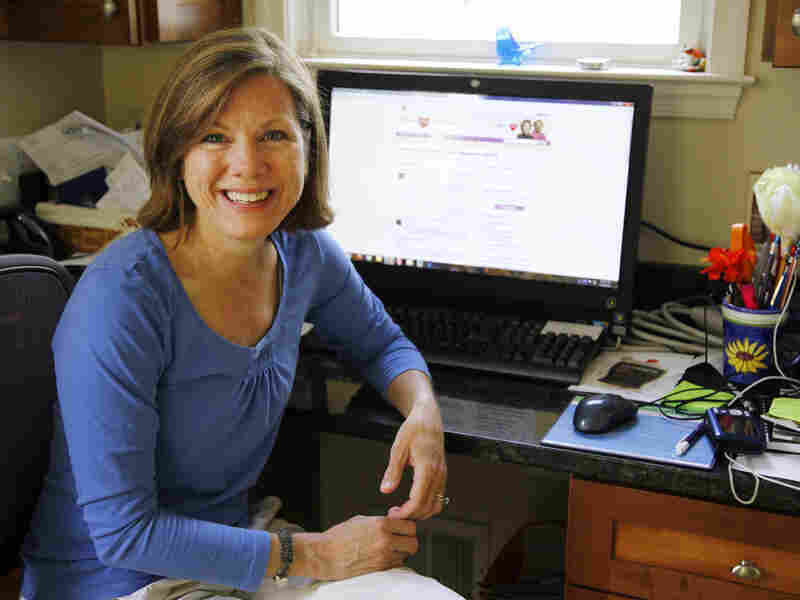 Patients Find Each Other Online To Jump-Start Medical Research : Shots - Health News Through their Facebook pages, chat rooms and message boards, patients are recruiting each other to participate in medical research in a kind of virtual word-of-mouth. Patient-initiated research is especially appealing to people with rare diseases whom researchers can't easily find. Katherine Leon says she spends up to 12 hours a day online interacting with others who share her rare heart condition. People with extremely rare diseases are often scattered across the world, and any one hospital has a hard time locating enough individuals to conduct meaningful research. But one woman with an extremely rare heart condition managed to do what many hospitals couldn't. Katherine Leon connected with enough people online to interest the Mayo Clinic in a research trial. Leon was 38, in great health and had just given birth to a baby boy. Then the unexpected happened: She had a heart attack. She was diagnosed with something called spontaneous coronary artery dissection, or SCAD. Leon didn't have high cholesterol, and her arteries weren't blocked by the typical atherosclerotic plaques that one finds in most patients with heart disease. Instead, the walls of her arteries had torn, and tiny fragments of tissue had blocked the flow of blood to her heart. It's a condition that affects primarily women, and it's also very rare — so rare her doctors told her that there were hardly enough people to study it. Leon recalls being dumbfounded. "In this day in age, to have a type of heart attack that had not been researched just seemed ridiculous," Leon says. So ridiculous that Leon says once she recovered from double bypass surgery she decided to do something about it. She started looking for other SCAD patients on the Internet. It took her a year to find her first patient. And another year or longer to find three more. And then, in 2007, the nonprofit advocacy organization WomenHeart partnered with a company, Inspire, to create WomenHeart Support Community on Inspire. It was through that online community that Leon began finding other SCAD patients around the world. "If they Googled SCAD — boom — up would pop our conversation and they could join right in. So that's when the numbers really exploded," Leon says. "And you know, every week we would get a few more and a few more, so that was really exciting." As the numbers of SCAD patients grew, Leon kept track of them, taking notes on their age and medical information. "I just kept a running document on the computer. And as it grew, that's when I thought, OK, research would be viable," Leon says. "This would definitely be something that I could compile and take to a doctor someday and try to convince them to research it." Eventually Leon found the opportunity she needed. At a symposium run by womenheart.com at the Mayo Clinic, she spotted cardiologist Sharonne Hayes. "She came up to me during one of the breaks at the meeting," Hayes says, "and she said, 'Oh, Dr. Hayes, what's Mayo doing for research on SCAD?' "
"And she said, 'Well, we aren't doing anything,'" Leon says. "I said that I knew over 70 women through an online community who had it all over the world, that we were in contact." She asked Hayes if she would be willing to research SCAD, and Hayes said she would. Hayes set up a virtual patient registry and allowed patients from all over the world submit their medical records and scans online. In the first trial, Mayo enrolled 12 patients — and had to turn people away. Hayes is now working on a second trial where she hopes to enroll as many as 200 patients. She says traditionally, one of the biggest barriers to studying rare diseases are the privacy laws that make it difficult to access hard-to-find patients. "I could not legally, ethically send out an email to all Mayo patients for instance, and say, "Oh, anybody got SCAD? You want to sign up for my study?" she says. But the rise of social media has allowed patients to do for themselves what researchers like Hayes can't: spread information about research. Through their personal Facebook pages, chat rooms and message boards, patients are recruiting each other in a kind of virtual word-of-mouth. "This is not investigator-initiated research, this is patient-initiated research," Hayes says, "and to a certain extent has been patient-sustained research in the case of our study." Leon sees herself, and other patients like her, as needles in a giant haystack; the Internet was simply the best way to sort themselves out. If more people could do that, she says, there'd be huge progress.